BAKERSFIELD, Calif. — While the Bakersfield Condors made history securing the team's first AHL playoff appearance, one fan has been paving her own way in the sport, hoping young girls will be inspired to follow their hockey dreams. Independence senior Hannah Haas is shooting through barriers. After stepping into her older brother's skates, Hannah grew to love hockey. With her dad's encouragement to pursue co-ed hockey, Hannah never backed down. “It has taken a lot to play with the boys," said Hannah. "Like [the] toughness. I had to break down a lot of barriers." "You know you’re not always going to be there to protect her," said Richard. "Sooner or later, something’s going to happen and you’re not going to be able to hold her forever." But soon, Hannah would eventually find her way onto an all girls team with the Los Angeles Lions. A team that she would further her hockey career. “I never, this never crossed my mind," said Hannah. “I kind of got emotional but it's been cool to finally see my dreams come true." 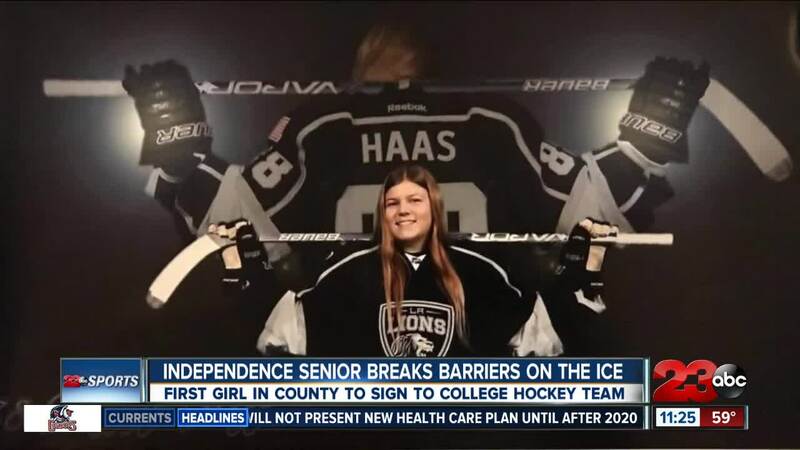 Hannah is now the first girl in Kern County to sign a letter of intent to play collegiate hockey. “I'm very proud of her," said Richard. "I just know that this isn’t it. She has the desire to do more." Hannah committed to Utah Valley University and hopes that her dream come true will inspire other girls. “I'm excited to continue my career, but also show younger girls that there’s a chance for them to go play hockey and stick with the sport, and do what they love," said Hannah.